Birmingham Assay Office is pleased to announce the appointment of a new trade Warden, Andrew. Due to its continued planned expansion programme Aquaflame Systems Limited is pleased to announce two. Birmingham Assay Office is pleased to announce the appointment of a new Chairman, Carol Brady. WB The Creative Jewellery Group are pleased to announce changes to its Gecko leadership team,. WB Team Goes from Strength to Strength! Weston Beamor have announced a new starter and two internal promotions to further strengthen their. Domino has announced an internal restructure, designed to ensure that the Birmingham-based 3D casting and. The British Society of Enamellers (BSOE) has appointed a new Vice-Chair, Silversmith and Enameller Monika. Each year, four Assistants at The Goldsmiths’ Company are elected to become Wardens, who meet. The Betts Group welcomes Lisa Davies as the new UK Sales Manager for Unity Wedding. 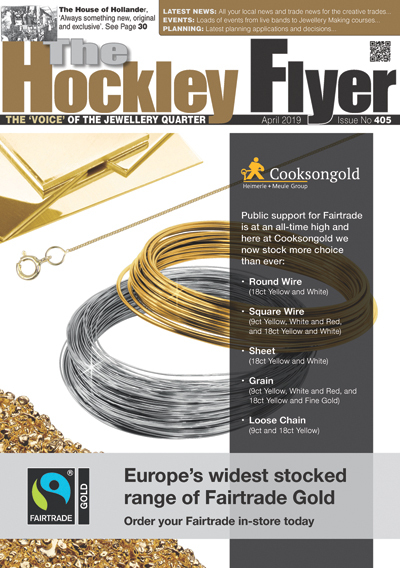 Birmingham fine and bridal jewellery manufacturer Hockley Mint has appointed Andrew Mills as National Sales. Weston Beamor are pleased to announce changes to its leadership team, with current Head of. AnchorCert Group, including Assay Office Birmingham, is pleased to confirm that it has appointed new. The Hockley Flyer has a new recruit – yes, it’s Bertie the cat! He has. Physiotherapist, Rhodri Parfitt, has recently joined Jewellery Quarter-based back and joint centre, Optispine Birmingham. He. Simon Rainer has received the Freedom of the Goldsmith’s Company at a ceremony held at. Weston Beamor, the Birmingham-based 3D printing, casting and bespoke manufacturing company, has restructured the workings. The AnchorCert Group, comprising Assay Office Birmingham, AnchorCert Analytical, AnchorCert Gem Lab, SafeGuard Valuations and. Wedding ring and jewellery manufacturer, Charles Green, embarks on a glistening 2017 with the recruitment. Sergeant Matt McVeigh, who has been our Police Sergeant, stationed at Vyse Street Police Station. Assay Office Birmingham has announced that its Chief Executive Officer and Assay Master, Stella Layton,. The Jericho Foundation helps people to become fulfilled, skilled and employed. One of the disadvantaged. Malcolm Francis celebrated working for 50 years in the Jewellery Quarter in September. Malc started. Weston Beamor has announced the appointment of three new members of staff to accommodate the. At the end of 2015, Holts Academy announced the launch of a new apprenticeship training. Trollbeads UK Responds to Passing of Fable Trading founder Sarah Morfoot Katharine ‘Sarah’ Morfoot, the. ‘My grandad James William James left the army in 1918 and having learned instrument and. Gay joined the School of Jewellery in 1992 as Industry Coordinator and became Centre Manager. Award-winning British jewellery designer Sarah Jordan has been named Creative Director of You Fine Jewellery,. Birmingham-based fit-out company Estilo Interiors has beefed up its management team with a senior appointment. The Birmingham casting house and bespoke jewellery manufacturing company, Weston Beamor has announced two new.